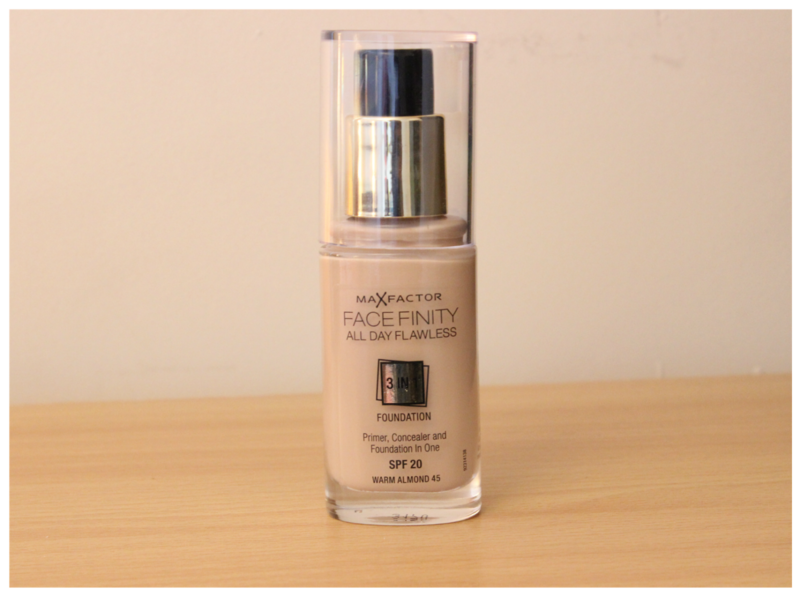 Today I am writing a review for Max Factor’s Face Finity 3in1 Foundation in Warm Almond 45. I have used this foundation for the past year or so and I just cannot go without it! The only thing I have changed is the shade I use, I had to go down a few shades because I noticed as my summer tan was fading, my foundation was making my face look a bit like a wotsit compared to the rest of my body. I am now using the shade Warm Almond 45 which is absolutely perfect, even if I do get a slight tan my skin will still blend in with my face. However the shade range is not the only thing I love about this foundation, the fact that it is a primer, concealer AND a foundation all in one! Which A) cuts time in the morning and B) saves you a bit of money because you don’t have to buy three products. The consistency is pretty thick until it starts running out then it thins out quite a lot. However, it doesn’t change how the foundation looks on the skin. Its a great foundation no matter what the weather is outside it stays put (even in heavy rain!) and it keeps those rosy cheeks hidden when it is chilly outside. There is only one fault I can find with it and that is if I’m having a bad skin day with breakouts or dryness it tends to build up around the area so it sticks out like a sore thumb! So if you have spot-prone/dry skin then I’d say stay away from this foundation unless you have skin like mine where it only freaks out occasionally. Other than that little blip it’s an amazing foundation and I think it’s worth its £11.99 price tag! I love that foundation i use it in the warm almond shade, but i prefer the covergirl version because of the price, but i cant find the equivalent of warm almond in covergirl which one do you think it is?